We’ve already discovered the best practices for making your petition a powerful tool for social and legislative change. Assuming your petition has been carefully researched and clearly written, how do you put it to work in the best ways? 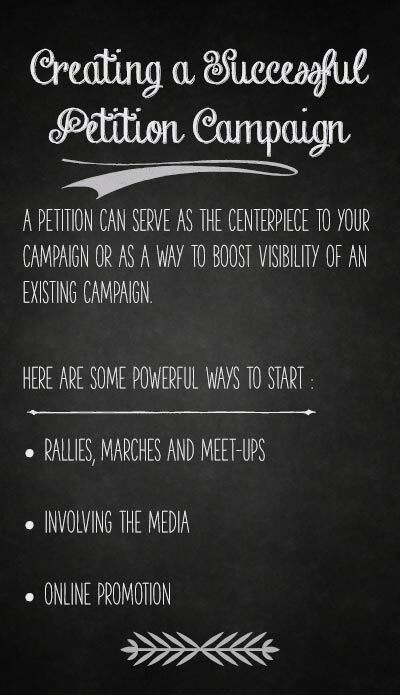 A petition can serve as the centerpiece to your campaign OR as a way to boost visibility of an existing campaign. More often than not, your Care2 petition functions as an important piece of a larger puzzle. No matter if your petition is the centerpiece or not, a petition is a great way to show decision-makers that you’re not alone in wanting change. But sometimes change doesn’t come with just a petition, so here are some of the most powerful ways that you can pump up the volume of your campaign. One way to raise attention for your cause is to gather existing supports of your petition to rally in person, ideally at or near the office of your target. A rally of supporters around your campaign is a great way to attract media attention. Before your rally, try to get in touch with your target by calling his or her office and asking them if they have seen your petition. Request a meeting with them so you can respectfully deliver your petition. Having a meeting with your target is the perfect opportunity for a rally of public support. Even if you don’t have a meeting, an in-person rally is likely to get your target’s attention. Use your petition as a way to reach out to local newspaper, TV and radio reporters. Reach out to contacts (typically posted on the outlet’s website) and let them know about your cause and the momentum of supporters. They’ll listen! Chances are, your target is sensitive to public opinion. Having your issue covered in the media shows the target that support is growing and that they are standing in opposition to a segment of the public. Nobody wants to be seen as the bad guy, so getting the press involved can be the difference in making your target feel the pressure. Need an example of excellent media involvement? Check out this petition to Disney to recognize children with Downs Syndrome in their films and TV shows. Once the press release was sent out, national news agencies picked up the story and raised significant awareness for the cause! Rallies are no longer confined to physical locations. Forming a Twitter group, a Facebook group, or finding like-minded people in online forums is an excellent way to promote and share your petition and boost awareness. Use your petition as a way to stay connected with your supporters. Care2 petitions have a built-in feature to update your petition and alert your supporters of new developments. Don’t forget to utilize Care2’s resources. Our platform supports your entire campaign effort. Send an e-mail to petitionnullquestionsnull@care2nullteam.com if you need more advice. Our campaign staffers will answer questions you have about initiating a rally or petition delivery event, the best ways to reach out to your family and friends, and we may even add your petition to our e-mail newsletters to our amazing supporters!